Ideal for school or organising your stationery at home! The Official Football Stationery Gift Set is presented in a plastic carry case with a handle and is perfect for kids to use in school. 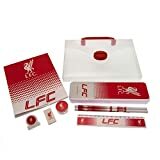 It contains a note pad, 2 pencils, ruler, eraser, sharpener, clip and a pencil box all in team colours featuring the club crest. It will be a perfect back to school kit for your kids. This item is an official product.